Originally printed on January 17, 2019 in the Broadway Ham & High. 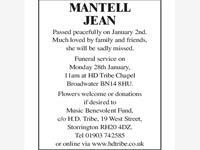 MANTELL JEAN Passed peacefully on January 2nd. Much loved by family and friends, she will be sadly missed. 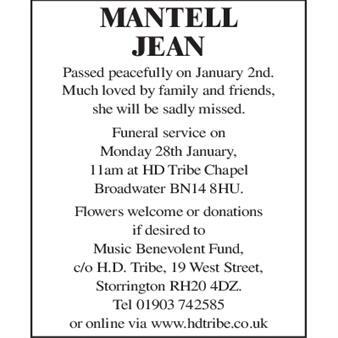 Funeral service on Monday 28th January, 11am at HD Tribe Chapel Broadwater BN14 8HU. Flowers welcome or donations if desired to Music Benevolent Fund, c/o H.D. Tribe, 19 West Street, Storrington. RH20 4DZ Tel 01903 742585 or online via www.hdtribe.co.uk"